A flexible porous sheet (collector) (11) is inserted between two flat membranes (10). Three sides of this sandwich are sealed (12). The open side is welded to a cylindrical collector tube (3) on either side of a generatrix through which holes have been drilled. Several such sandwiches are installed, separated from each other by a spacer (flexible plastic screen) (9). The fluid to be treated circulates in the spacer (9), parallel to the collector tube; the collector (11) discharges the permeate to the axial collector (3). An element’s diameter can range from 5 cm up to 30 cm. 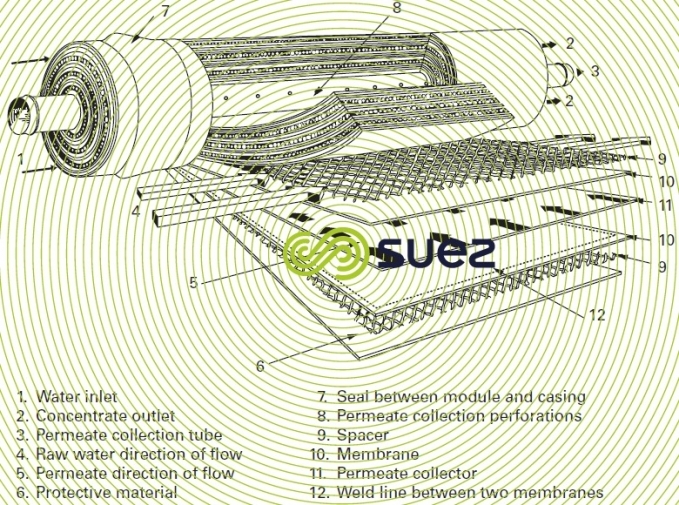 30 cm to 1.5 m long, the system provides 0.3 m² to 41 m² membrane developed surface areas. Several elements (two to eight) are installed in series in the same cylindrical housing by coupling collector tubes (3) using connectors equipped with 'O' rings that provide perfect sealing and withstand compression loads (cause by the flow's head loss as it travels through the module's spacers). It is easy to understand the importance of a good connector installation and of limiting head losses (maximum 0.5 bar per element). Nowadays, virtually all desalination modules ( NF to high pressure RO ) are constructed using this geometry with the exception of the Hollosep – Toyobo modules referred to above. Indeed, this is the most compact of all current modules and has a lower head loss than the plate type module. On the other hand, it is more susceptible to fouling, requiring water that has been properly pre-treated, with fouling indices (FI) or silt density indices (SDI) under 4 or 5 (see measuring global parameters). In some special cases, the use of thicker spacers can reduce this susceptibility to fouling and, above all, make these modules easier to clean chemically.